The following is a short introduction to some aspects of Dmist’s patented video enhancement technology. All these parameters are subject to change; some over the image area, and some over time as weather conditions change. The amount of scattering is also dependent on the wavelength of the light. There is a common belief that a dispersive medium such as fog scatters the light originating from the scene itself and so blurring the image to such an extent that original image recovery is very difficult (if not impossible). The simple simulation of a “foggy” scene shown below suggests that this is not the case. An image of a greyscale ramp (representing the general range depth of the scene) is added to the “ideal” image. The result is a characteristic foggy scene with the background obscured and all colours appearing washed out. The technical and innovative challenge is to reverse this process; provided with just the “foggy” scene, estimate the contribution due to airlight scattering and so recover the original scene. Under poor atmospheric conditions (haze, fog, drizzle, etc. ), our technology estimates the contribution of the dispersive intervening medium to the observed image. This is determined using models based on the physics of atmospheric scattering. As the degree of degradation will change over time, this estimate is updated regularly. 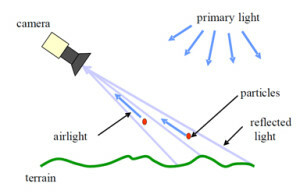 The scattering contribution is calculated for each of the three colour channels (red, green and blue). This permits the accurate reconstruction of true scene colours in the enhanced image.